One person has been killed in Taiwan's capital Taipei in a house fire following a 6.6 magnitude earthquake. 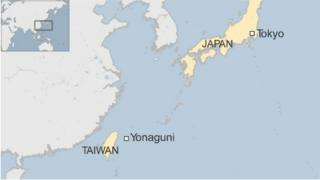 The quake struck near Japan's Yonaguni on Monday morning. Buildings swayed in Taipei and people were seen rushing on to the street, but no significant damage was reported. Japan, to the north, briefly issued an alert about a possible 1m tsunami for its southern Okinawa island chain, but lifted it after an hour, with no sign of high waves or damage. The Japan Meterological Agency said the earthquake's depth was "very shallow". Taiwan's Central Weather Bureau said it detected two earthquakes, one measuring 6.3 and another of magnitude 5.0, east of Hualien county. Emergency service officials said the quake caused an electricity transformer to explode, sparking the fire in which an elderly man died. The US-based Pacific Tsunami Warning Center had said a "destructive Pacific-wide tsunami was not expected". Japan sits in a region with high tectonic plate activity, known as the Pacific Ring of Fire, and registers more than 20% of the planet's most powerful earthquakes every year.